Betcey opened Beyond Beadery in 1987 in Woodstock, New York. She and her husband regularly load 5 tons of beads and Swarovski Elements into their truck and haul them across the country, setting up shop for a few days before packing it all up again and moving on to the next bead show. When not on the road, she can be found in her Colorado mountaintop home, selling crystals and beads via the internet. 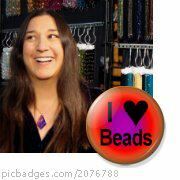 Betcey's life as a traveling bead gypsy was featured in Beadwork magazine in April 2009, and her Swarovski-rich designs have been showcased in a number of books.